Die Villa Pianesante ist ein Steinbauernhaus aus dem 17. Jahrhundert auf einem Hügel, umgeben von unberührter Landschaft, zwischen Todi und Orvieto. Es gehört zu den ausgedehnten Ländereien des TodiCastle Estate. Obwohl das Haus vor Kurzem vollständig restauriert und zur heutigen Nutzung umgestaltet wurde, hat es sich die Atmosphäre eines traditionellen umbrischen Landhauses bewahrt. Es wurde mit alten Terrakottaböden und Deckensichtbalken restauriert. Die Badezimmer sind groß und komfortabel. Es verfügt über eine gut ausgestattete Küche und ein großes Esszimmer. Es sind fünf Doppelschlafzimmer, drei Wohnzimmer und fünf vollständige Badezimmer vorhanden. Das Haus befindet sich am Ende einer Privatstraße und ist eingezäunt. Vor dem Haus befindet sich eine große Terrasse mit Esstisch und Blick auf das Tal. Eine große Terrasse mit Gartenmöbeln und Grill umgibt den Swimmingpool. Ein Original-Pizzaholzofen ist vorhanden. Der Blick vom Swimmingpool geht auf die klassische Landschaft hinaus. Weitere Informationen finden Sie auf unserer Website, bitte fragen Sie nach dem Link. die während Ihres Aufenthalts stattfinden. In Todi Tennis, Bogenschießen, Reiten, Golf. Die Gegend um Todi ist für ihre Naturschönheit berühmt. Die Landschaft ist wunderschön, zahlreiche Ziele sind zu Fuß oder mit dem Fahrrad erreichbar. Drei Mountainbikes stehen unseren Gästen zur Verfügung. Ein markierter Weg führt durch den nahen Wald. Umbrien ist für seine hervorragenden Produkte bekannt, exzellente Feinschmeckerrestaurants befinden sich in der Nähe. Wir beschreiben und empfehlen Ihnen gerne die besten. In der Villa Pianesante verfügen wir über einen hervorragenden Koch. Auf Anfrage bereitet er hervorragende Mittags- und Abendmenüs für unsere Gäste zu. Außerdem sind Kochvorführungen, Weinproben und Kochkurse möglich. Der Koch bespricht das Menü persönlich mit den Gästen. Die meisten verwendeten Zutaten stammen von Höfen aus der Region (Öl, Eier, Gemüse, Obst und Wein). Alle Zutaten sind „bio“. Außerdem verfügbar: Massage, Babysitting, Führungen, Weinproben, Auto mit Fahrer usw. Thank you, it was a pleasure to have you and your family staying with us. Stayed in Villa Pianesante with 7 friends and couldn't have had a better time. Great views, awesome grounds, great staff and a ridiculous amount of space in the villa. Mario helped us set up a few wine tours as well as a fantastic dinner in nearby Acqualoreto. He couldn't have been more accommodating! Highly recommended place if you're into, you know, having an AWESOME time in Umbria. We had a wonderful stay at the lovely Villa Pianesante at the end of May. The most important thing to mention about our stay is the amazing hospitality and generousity of the owner Mario. We were 2 couples, 2 kids and 1 dog and we had originally booked our stay at the smaller Villa Cipresso, but Mario was generous enough to upgrade us to the huge Villa Pianesante because we were lucky to be the only guests that week. My husband and I are very interested in food and wine experiences and I bombarded Mario with emails and questions, both before and during our stay, and he always responded with excellent recommendations. He also arranged for us to receive a gift of delicous wild asparagus, just because they were in season and he wanted us to try them. This is just one small example of the incredible hospitality at Todi Castle, which is really what sets them apart from others. We booked the private chef for several meals, including a lovely welcome dinner on the day of our arrival as well as a pizza party for the kids. The pizza party could perhaps have been more hands-on with the kids, but again I think it is really more a question of telling them what you want. Please make sure to book massages by the pool, a great experience. We were also invited to have one of the dinners booked with the chef at the castle, which was an amazing experience with the dinner served in a medieval tower with a huge fireplace and an armor in the corner - the kids loved it. The villa itself is lovely, old, but modernised Italian style with a comfortable living room and lots and lots of space. It is huge. The kitchen could perhaps have been better equipped with some sharper knives and more bowls, but I think this is a common flaw in rental houses. We were impressed with the cleanliness of the house, considering the size. Everything was spotless. The grounds and views are incredible. The house is surrounded not by a garden, but rather a park with olive trees and wooded areas - and the entire property was completely fenced in which was perfect for us because of the dog, which could roam freely. The pool was beautiful, if a bit cold at the end of May when the season was just getting started. The villa is very private, but still centrally located for Umbria sightseeing and not too far from Todi, which is a lovely town. Make sure to have pizza one night at the pizzaria Rosa nearby, the best pizza I have ever had and homemade limoncello, wonderful. TodiCastle is Magical! I joined some friends at TodiCastle for a week and loved it. Mario, Sabrina, Katrina and the rest of the staff made it a week to remember. Villa Piesante is an unbelievable 5 bedroom 5 bathroom private villa with it's own pool and spectacular view of the neighboring towns. You know when you pull up you are going to love it, then walk in to find the complimentary welcome basket and it's time to sit down and watch the spectacular sunset. We had dinner in the small town of Fiore at Rosa dei Venti twice and I swear it was the best pizza I have ever had, the other dishes were excellent also. We took day trips to Assisi, Florence, Spoleto, Todi and one of my favorite cities in Italy, Orvieto. If you are looking for any kind of ceramics, Deruta is only 45 minutes away. While some couples flew into Rome and came directly, others visited other parts of Italy the week before then came to TodiCastle to relax. Our final night there Mario hosted a delicious dinner in this beautiful medieval room with a giant fireplace. Mario was kind enough to give us a tour of the castle and we were able to see some of the rooms that are decorated with antiques and family treasures from all over the world... it's like a museum! I am recommending it to anyone visiting Italy and will definitely return. Mi Piace TodiCastle!!! 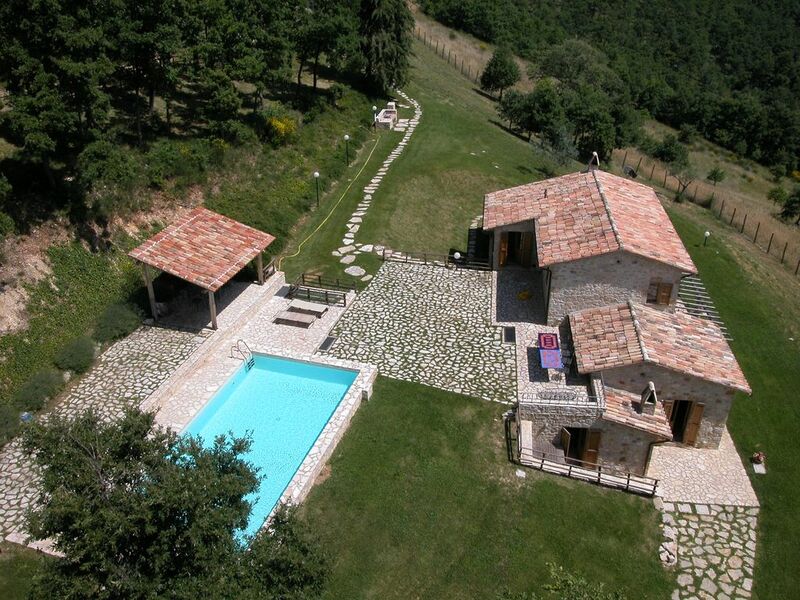 Villa Pianesante is the perfect place to stay! Villa Pianesante was clean and super well-maintained. Mario and his staff provided an excellent customer service. I would strongly recommend this property. There were plenty of activities, attractions and restaurants in the area. It was amazing. Go there ! Biggest villa of the estate!! We had a big come-together holiday with the family and this villa was just perfect! There was more than enough room for everybody, also to take some time for your own. With the big swimming pool, great nature and incredible good pure Italian hospitality, this was a holiday that we'll never forget! Die Villa Pianesante befindet sich in günstiger Lage nahe Todi, Orvieto, Spoleto, Assisi, Gubbio, Siena, und Perugia. Auch Tagesausflüge nach Rom und Florenz können arrangiert werden. In der Umgebung gibt es eine Reihe unglaublicher mittelalterlicher Kirchen, römischer Türme und fantastischer Renaissance Piazzas zu entdecken. Das ganze Jahr über finden zahlreiche Festivals statt. Ballett, Musik, Theater und Kunstausstellungen. Die berühmtesten sind das Todi Festival, das Umbria Jazz Festival und das Spoleto Festival. Der Eigentümer der Villa Pianesante informiert Sie gerne über alle Kunstfestivals, die während Ihres Aufenthalts stattfinden. Das lokale Handwerk ist sehr interessant, vor allem die Keramikarbeiten in Deruta (nahe Perugia). Diese Kleinstadt blickt auf eine lange Tradition in dieser Kunst zurück. In Todi Tennis, Bogenschießen, Reiten, Golf. Weitere Aktivitäten: Massage, Führungen, Koch, Weinproben.